Time for Albuquerque Mini Maker Faire! 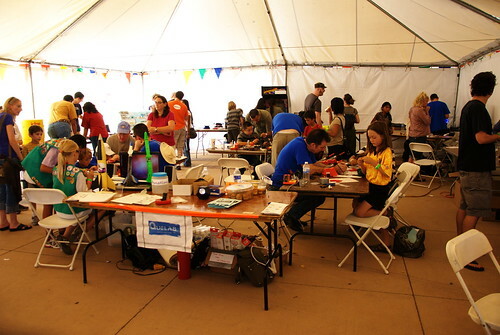 It’s the 2015 Albuquerque Mini Maker Faire! There’s going to be all kinds of fun and interesting things for adults and kids of all ages: drone racing, model rockets, building and decorating the Go VanGo art car, propane flame effects, virtual and hands-on welding, interactive projects from Intel, learn to solder. Let your creativity, invention, and resourcefulness out to play! Quelab will be there with 3D printers, a giant spirograph, a wood lathe, CNC machines, a solar hot air balloon, and too many other things to list. Look for the giant white tent on the North side of the museum. Well Albuquerque’s first Maker Faire(Technically by registration, its called a “Mini Maker Faire”) was pretty amazing. I knew full well it was not going to be of the epic proportions that the Big Grandaddy Maker Faires are, but as a start this one was very good! Quelab was very busy throughout most of it, We ran areas where we helped huge numbers of people learn to solder(from the pretty young to the not so young!). And showed off the Zork Teletype, helped troubleshoot the squishy circuits. Showed off 3d printing, and let folks play our restored Asteroids classic video game. Not to mention, members also setup live action angry birds, (with the cutest hand made birds and pigs), button making, and much more! A nearly full list of what all was there can be found here! Flickr Group of Collected photos from the Maker Faire, If you use flickr please join the group and add yours! We will add some more from the Quelab Project DSLR tonight or tomorrow! For anyone who met us and thinks they would love to become a part of what we are! Come on down to a Hacknight (pretty much they are just openhouse nights). If you didn’t get to learn to solder, we can help. If you have ideas or projects that too is what we are about enabling! And if you are already sold on the idea, please consider becoming a member! your memberships help us operate and grow! And a huge Thank You to the Organizers, Other Volunteers, Makers, and attendees, you all helped make this great! And lets start making things for AmMF2013!